Zoning in on the number of ingredients in packaged foods is one of the stupidest consumer driven trends to date. Fueled by the unsubstantiated fear of anything not immediately recognizable or easy to pronounce, companies are turning to “fewer ingredients” to make their food stand out on over-crowded store shelves. Short, recognizable ingredient lists are leading packaged food trends in 2016 yet the number of ingredients or your ability to pronounce an ingredient has absolutely nothing to do with the nutrition value of the food and therefore shouldn’t guide your buying decisions. Shorter ingredient lists do not mean a food or beverage is better for you. Companies that make chips, ice cream and other dessert items are among the fiercest competitors for simplifying ingredient lists. According to an article in the Huffington Post, Hershey Co. improved their classic chocolate syrup by cutting the list to 5 simple ingredients. The new version took food scientists a year and a half to make with recognizable ingredients. The challenge? Making a syrup that also tastes good. The new version with cane sugar and organic invert cane syrup instead of high fructose corn syrup will cost you 1 more gram of sugar than the original version. How does this make it nutritionally superior to the old version? Here’s another example. Let’s say you are in the grocery store debating between protein choices for dinner. 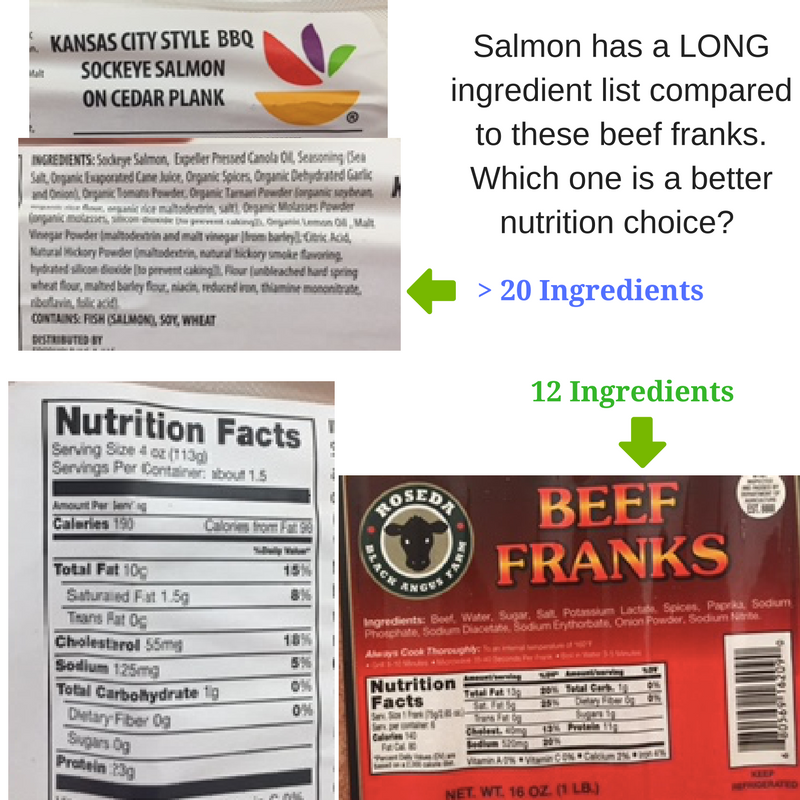 Do you pick up the omega-3 and protein-packed (23 grams for 190 calories) salmon or beef franks (15 grams protein for 190 calories and 3x the saturated fat). I hope you choose the salmon if you are choosing based on nutrition value. I found many similar examples in the grocery store including potato chips with just a few ingredients compared to whole grain, higher fiber crackers with three times the ingredients and Häagen-Dazs ice cream with five ingredients, 250 calories and almost 5 grams of sugar per ½ cup compared to Giant brand ice cream with more than twice the number of ingredients, 160 calories and less than 3 grams of sugar per ½ cup. If you are choosing your dessert not based on taste but instead based on the nutritionally superior option (because that’s why people are focusing on the total number of ingredients right? ), you’ll pick up the Giant brand with more ingredients. Head over to Cooking Light or any other well-recognized cooking magazine and I’m willing to bet you’ll find ingredients that you don’t recognize and can’t pronounce. I live in the world of food, nutrition and supplements and restaurant menus often stump me while the sheer number of unfamiliar spices in Penzeys Spices satisfies my creative desire for something new and unique. Just because an ingredient is unfamiliar to you does not automatically make it bad. After all you’re probably not a food scientist entrenched in the world of food development and food safety. Some misunderstood ingredients are emulsifiers – they help ingredients stay together in a mixture vs. separating (for example, salad dressings often contain emulsifiers including lecithin), others add nutrition value, help products retain their color, prolong shelf life or keep the product safe. Pyridoxine hydrochloride sounds scary right? It’s a vitamin B6. Cyanocobalamin? That’s vitamin B12. Beta-glucan? Oat and barley beta-glucan are soluble fibers sometimes added to food to increase the fiber content. They also help you feel more full (satiated) and are fantastic for your immune system. Lupin kernel fiber – lupin is a legume. In other words, it’s good for you. All substances allowed in food in the U.S. are GRAS – Generally Recognized as Safe by the Food and Drug Administration. Even though manufacturers are scurrying to chop down their ingredient lists to meet this silly consumer demand, focusing on the number of ingredients in a food isn’t worth your time or attention span. If you don’t order food in a restaurant based on the number of ingredients used in the recipe why would you choose foods in the grocery store based on the total number of ingredients? In addition, don’t be scared of any ingredient with a sprinkling of scientific reasoning behind its use. Yes, it’s that time again and the thought has probably crossed your mind as 2011 comes to a close. The annual New Year’s resolution. 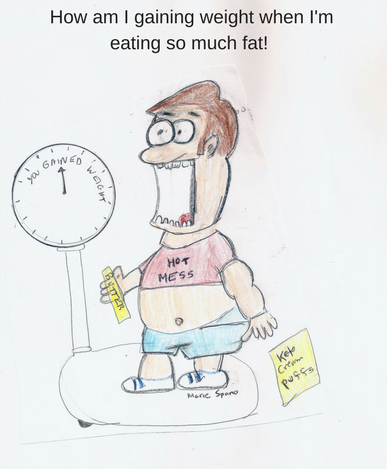 And, according to many popular media sources, losing weight tops many people’s resolution list. Yet our nation is in a major health crisis. Something isn’t adding up and though many people realize they should take charge of their health, they are not taking the right approach to fix the problem. If the majority of people continue to ditch their goals by February, we will continue to see the rate of obesity, diabetes and heart disease rise. If losing weight is on your list of New Year’s resolutions, or even if it isn’t, I am going to tell you about one big dietary change that will yield big results: boosting your fiber intake. Feel full longer: Fiber provides “bulk” to your diet which helps control hunger, as it takes time to move through your digestive tract leaving you full throughout the day. Eating a high fiber breakfast every morning will start your day off right. Try oatmeal with berries and low-fat milk or whole wheat toast with peanut butter and a banana. Digestion: Fiber will regulate your bowel movements and this helps keep everything moving out of your system, including some residual toxins. Lowers LDL cholesterol levels and risk for heart disease: Increasing fiber may contribute to lowering LDL cholesterol levels, blood pressure and inflammation in the body. Controlling these health markers will help protect your heart. Try this easy, high fiber hors d’oeuvre for your New Years Eve party. I have already made it for several holiday parties and it was devoured. Pre-heat the oven to 425 F. Slice each bacon piece in half, short ways. Roll a piece of bacon around each date and pierce with a wooden toothpick. Place wrapped dates on a sprayed baking sheet (set ½ inch apart). Cook for 13-16 minutes, turning once to ensure the bacon crisps on all sides. Place on a rack to slightly cool and serve warm. Peas are also a high fiber food and Black Eye Pea dips and dishes are a big New Years Tradition here in Oklahoma. Get your fill of fiber with peas as you ring in the New Year! [SS1]What other word can you think of? I feel like ‘diet’ has already been over-used. [SS2]Marie- isn’t that right? Please delete if you think it sounds weird/incorrect.